U.S. Senator Tom Carper (D-Del. ), highlighted significant Delaware wins in the bill America’s Water Infrastructure Act of 2018 (AWIA) — a major bipartisan, bicameral water infrastructure bill. On Oct. 15, at the Port of Wilmington, U.S. Senator Tom Carper (D-Del. 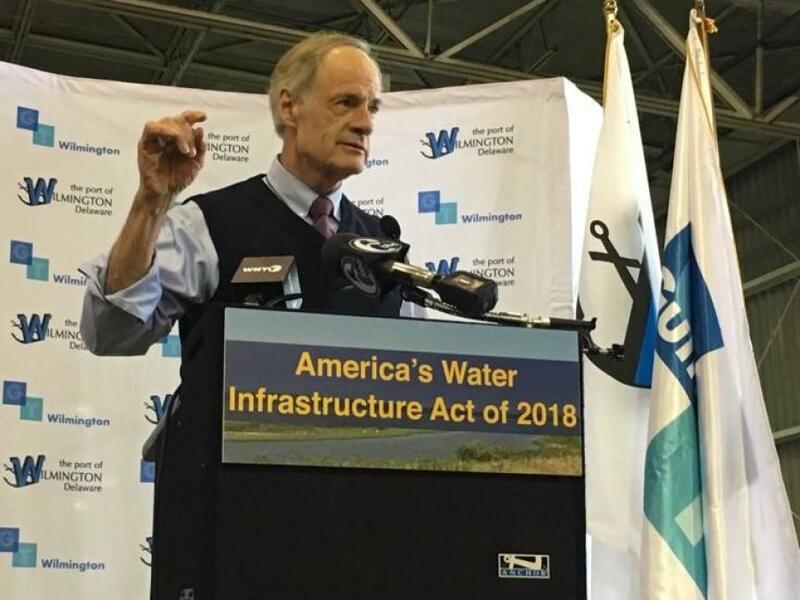 ), top Democrat on the Environment and Public Works Committee (EPW), highlighted significant Delaware wins in the bill America's Water Infrastructure Act of 2018 (AWIA) — a major bipartisan, bicameral water infrastructure bill that Carper co-authored along with Senators John Barrasso (R-Wyo. ), Ben Cardin (D-Md.) and Jim Inhofe (R-Okla.). Specifically, for the Port of Wilmington, this bill increases the existing height limit authorization for the deposit of dredge material from the Delaware River dredging project from 10 to 35 ft., which is a necessary development to expand the Port at the new Edgemoor location and double its annual output. Carper was joined by Congresswoman Lisa Blunt Rochester (D-Del. ); Eric Casey, CEO of Gulftainer USA Port of Wilmington; Ernest Bryant, president of International Longshoremen's Association, AFL-CIO 1694-1; and Kimoko Harris, business agent of International Longshoremen's Association, AFL-CIO 1883. This is the first major infrastructure bill to pass this Congress. The legislation advances key programs and makes much-needed legislative changes to support clean drinking water systems, waterways, beaches, and port projects, such as the expansion of the Port of Wilmington. It directs the Army Corps of Engineers and the Environmental Protection Agency (EPA) to make vital improvements to water infrastructure to prepare Delaware — the lowest lying state in the country — for the growing risks of climate change. This bill also prioritizes the needs of stakeholders in Delaware and around the country to make sure the economy grows in a safe and environmentally friendly way. The bill passed the Senate by a vote of 99-1. "This infrastructure bill delivers for Delaware and families across our country, and I'm proud that it's on its way to be signed into law. It makes smart investments in critical water infrastructure we don't see every day, but that Delaware and families in every state rely on, such as drinking water systems, dams, reservoirs, levees, and ports. And this bill creates a nurturing environment for good-paying jobs here at home, incentivizes businesses to buy and use American products, and authorizes funding for EPA to expand investments in clean drinking water for the first time in more than two decades," said Carper. He continued, "I fought hard to make sure key priorities for Delaware were included in this bill, and I'm proud we were able to deliver. For our state, this bill includes a new $75 million program to address critical beach nourishment projects along our coasts, authorizes new funding and provides new tools for communities like Blades and Millsboro to help address drinking water contamination, and makes sure the Port of Wilmington has the resources it needs to move forward on its expansion project that will keep it competitive for years to come. At the same time, this bill promises greater transparency and improves collaboration between local and federal governments to ensure taxpayer dollars are being used efficiently." expands the lead in schools testing program to provide schools with additional assistance to address lead contamination, including the replacement of drinking water fountains.